Cleanse, condition or treat with the appropriate Biolage R.A.W. Haircare Shampoo and Conditioner/Mask. On damp hair, apply Biolage R.A.W. Bodifying Styling Jelly for natural looking body and lift at the base and Biolage R.A.W. Smoothing Styling Milk on the mid-lengths and ends. Blow-dry using a large round brush starting from the nape, working up the head. 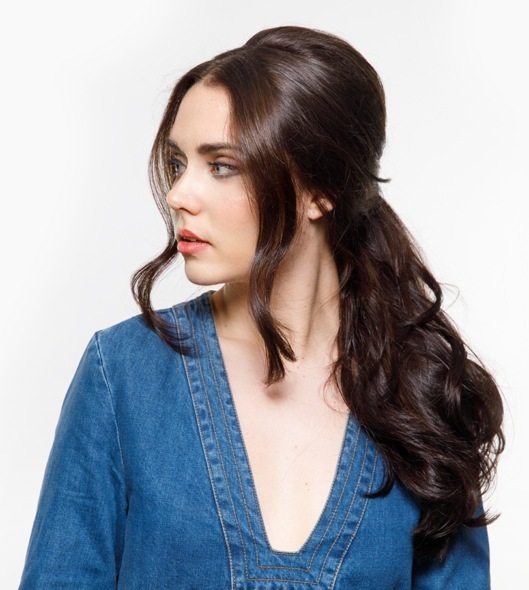 Create loose waves with a large barrel curling iron. Create a center part from front hairline to high point of the head, leaving the sides loose. At the top/crown section, backbrush for height and isolate section. Create a ponytail just above the nape, concealing elastic with hair wrapped around base. Incorporate height at crown into ponytail base and pin in place. Using a styling brush, drape sides to cover ears and pin into base of ponytail, leaving out the face framing pieces. Creates natural looking body and soft lift to the hair. Ease the grip of blow dry while enhancing hair with nourished style. Restores shine to stressed, sensitized hair using ingredients like yucca, goji berry, coriander oil and kaolin clay. Purifies flat, fine hair without harsh stripping using ingredients like black sesame, grapefruit, kiwi and kaolin clay.